I’ve been in some pretty hairy scenarios in a race car. I got in a wreck once during testing at Road Atlanta — an extreme, high-impact wreck that I could see coming for maybe one or two seconds — and I broke my ankle. There was another wreck, also at Atlanta, where I flipped through the air, and that was pretty bad. But the most scared I’ve ever been was when I raced in the rain. After all, in F1, they race in the rain, and all of us drive our day-to-day cars in the rain. The 2008 and 2009 Napa Auto Parts 200 Nationwide races were run at Montreal, Canada, at the Circuit Gilles Villeneuve. It’s a road course, an F1 track, primarily. It rained both times, and they were the only times that NASCAR ran races in the rain. One thing about racing in a foreign country is that it’s hard to delay a race. You’re traveling with passports and visas. You’re limited for a certain amount of days that you can be there, and you have to honor that. When you’re in an international event, that race needs to run — literally — rain or shine. So Goodyear built a special tire for the rain. 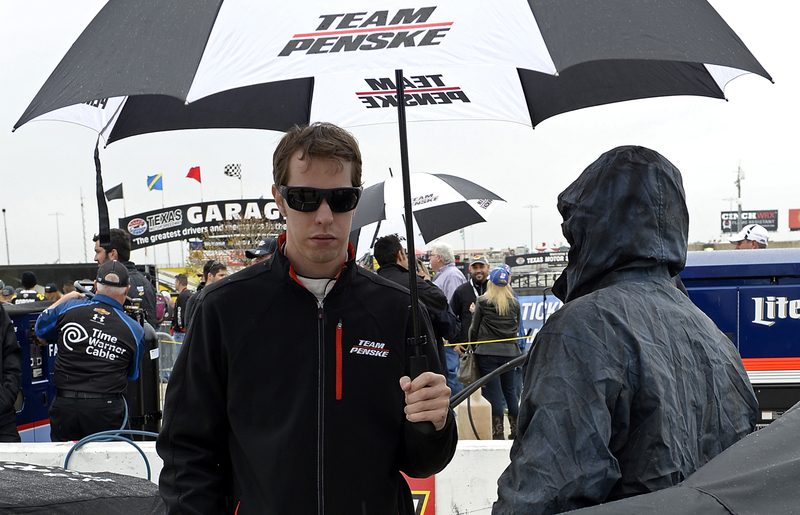 Here’s the thing: NASCAR guys don’t drive in the rain. The 2008 race had Joey Logano, Clint Bowyer, Carl Edwards, and some other NASCAR drivers in it. But a lot of the others were specialists. When you go to road courses, especially international road course races, you tend to get people who aren’t normally on your circuit. And those guys come from a road or even a sports car-type racing environment, so rain driving is in their wheelhouse. From a driving standpoint, one of the only benefits of driving in the rain is that it helps keep your brakes cool. Aside from that, we had no idea what to expect, especially grip-wise. A lot of driving a race car is about building experiences, building a feel for the car in a corner. The best drivers in the world are the ones that can do that the quickest, who can get a feel for their car the quickest. 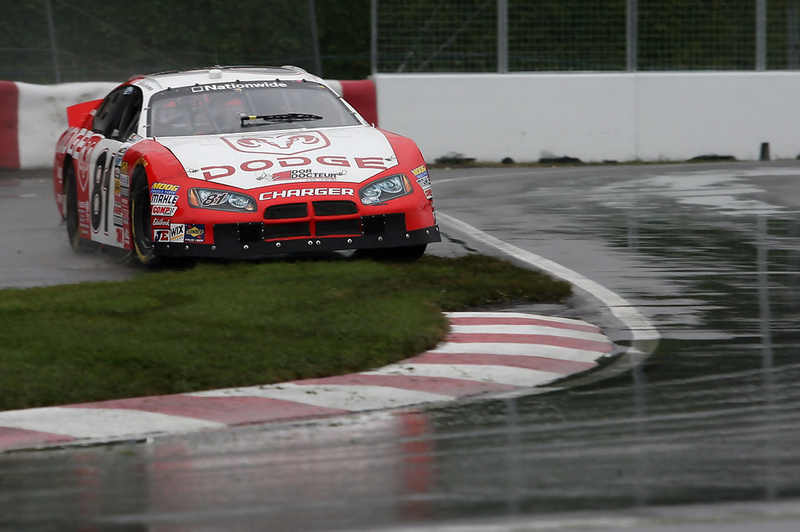 Like I said, none of the NASCAR guys had ever raced in the rain before, and in the rain, the grip changes constantly. On a road course, you also wind up off the track — and in the dirt — quite a bit. When that dirt becomes mud, you bring a lot of it back onto the track with you. That creates its own set of issues. The 2008 Napa Auto Parts 200 lasted 48 of a scheduled 74 laps. It didn’t take long for me to figure out why racing a NASCAR race in the rain is different from an F1 race. The more cars there are on the track, the bigger the wheel spray is. There were 43 stock cars on the track at Montreal — a lot more than in F1 — and as each car went through the rain, it picked it up and shot around the back half of the car. Imagine a huge cloud of spray on top of the racetrack. That’s what it was like. It just killed your visibility. You couldn’t see a brake light. Now imagine going down straightaways at about 180 mph when you can’t see more than 20 feet in front of you. You’re blind as can be. But here’s the thing: If you don’t go full speed, you’re going to get run over by someone who is. At points, the visibility in front of me was so poor there was no point in looking out the front windshield. So I literally drove — and keep in mind, this is probably at 160 to 180 mph — looking out the side of the car. There were markers on the track telling you how far you were from the corner: 600 feet, 500 feet, 400 feet. By looking out the side window of the car, you could see where you were, and then hit the brakes, start slowing down and downshift through the corner. Of course, it wasn’t just the straightaways where the rain was a problem. Road course tracks are usually very flat, which means the water doesn’t drain on its own. So you can go through standing puddles of water. Three quarters of the way through in Montreal, the puddles were literally getting to the point where they were impassable. The cars were getting drowned in water. When they finally red flagged the race, cars were wrecking under yellow because you couldn’t see each other, even going 35 mph. I ended up 12th. My teammate at JR Motorsports, Ron Fellows, won the race. He was a road course driver. A year later, it was raining in Montreal when the race started, but it was much lighter. When it was lightly sprinkling, it was actually fun. On the other hand, running a race under half dry, half wet conditions is probably the most dangerous condition you can find yourself in on a race track. If you race with a rain tire on a track with that’s partially dry, there’s so much rubber on the tire, it quickly overheats. They’ll literally just melt right off the car and explode, and you’ll wreck really, really hard. In the closing laps of the 2009 Napa Auto Parts 200, we were all on rain tires. The track was mostly dry. Tires were melting off the cars. I wound up finishing fifth. A related question I get asked about when it comes to rain is what it is we’re doing during the delays. Our sport isn’t really made for people to sit around and wait. A lot of times during delays, you wind up walking over and catching up with another driver. I sometimes wind up chatting with Carl Edwards because being cooped up drives him crazy. He’ll get out of the bus and walk around in the rain. On our race teams, we probably have 10 to 15 guys that work on the cars, and then another six to 10 guys that go over the wall on pit road. During a rain delay, the garage stall is blocked off. So what you’re left with is about 20 people, give or take, who are all fighting for space in the 53-foot trailer of the team hauler. We’ve got guys laying everywhere. There’s guys laying on the ground. It becomes very much like what I imagine it would be like if you were in the Navy, and stuck on a ship together. All of the food is usually gone within the first few hours. It’s like a series of locusts come through. Everything gets eaten. There’s also a lot of napping. You’re trying to store energy so you can use it later. Beyond that, you get iPhone and video game playing, cards, that sort of thing. When the delays go a little longer, a few other things tend to happen. Some guys will take the time to talk about their family life — girlfriends or wives — and maybe vent on that scenario, which can be good (or not so good). It’s a forced bonding experience. Without the rain, everybody is so busy working that you don’t really talk to each other outside of work duties. So in a way, it becomes kind of a group therapy session. Then there’s the pranking. When you’ve got a lot of time to kill, you wind up with a lot of practical jokes. We’ve got one guy on our team — our tire guy, Jim Davis — who loves to take those opportunities to pull pranks on people. J.D. is the type of guy that you don’t fall asleep around. I remember once when I fell asleep on my back. Someone took a salt and paper shaker, leaned over the top of me, and dumped it all over my face. That’s the less crude stuff that goes on. At its worst, it’s a lot like a college frat party. You don’t want to pass out on the couch at a frat party. If you’re going to fall asleep during a rain delay, you make sure you get somewhere private and hidden where nobody can find you, which is not always easy to do. Looking back at those two races in Montreal, I like that NASCAR tried to experiment with something different. That’s one of the benefits of our lower racing series. They can try different things, and see how they play out. NASCAR gave it a very good try with rain racing over those two years. In the end, though, we’re better off when it’s dry. The safety issues can’t be understated. And whether you’re behind the wheel of a stock car or in the stands, we can all agree: It’s quite miserable to sit at a race in the rain.